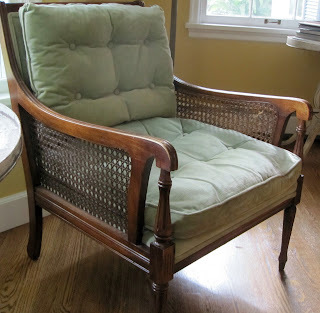 I found this cane chair at an estate sale and happily paid full asking price - $10! just kidding, it really wasn't bad, I promise! The black secretary was a fun Craigslist makeover here. I'm not the only one at our house who loves a classic Greek key fabric! didn't make the box cushion or double welt since it was my first time. I chose one covered button centered on the back cushion - brave, I know! 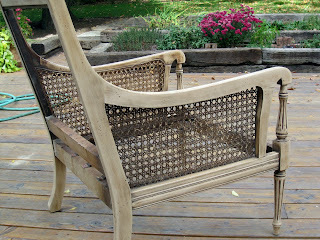 ~ remember the photos you took - follow them as you reupholster! It adds a nice touch to the living room update! Looks GREAT. The original owners are going to want their chair back. Oh my gosh, Pam! What a fabulous job you've done. I've never reupholstered anything on my own, but you've given me hope that I might be able to pull it off! Hi, just jumped over from Lori's blog post! Wow what a transformation! Great job :) I'm a new blogger to ....just joined your friend connect site! Happy Blogging! I love this chair! The fabric looks great! -visiting from Lori's blog! Wow! Your "new" chair is beautiful! I've never re-upholstered anything but your blog is making me feel brave! Just beautiful! Love that fabric! Holy chair!! This is an amazing makeover. I love the fabric! I'm your newest follower. Fabtastic! I love your restyle nice fabric choice. I like the name of your blog also, stop by for a blog visit!! That looks incredible! Such a good fabric and paint choice. I'm about to redo some cane wingback chairs and I can't decide between doing a solid or a fun pattern on the cushions. Your example might have just tipped the scales! Hi Pam! Just came across your blog! What a great site you have! 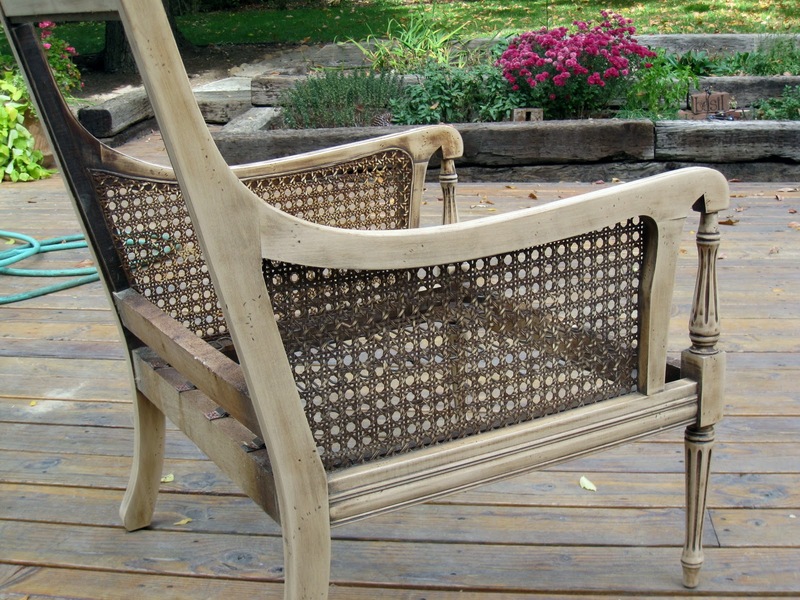 Love what you did with this chair! Just gorgeous! I am your newest follower; and I hope you will follow me, too! Blessings to you!! What a fantastic makeover! Great work. visiting from vintage vine. Saying I love this chair is an understatement. Did you paint the frame after stripping it?? I am over from Savvy Southern Style. I will be back!! !